For those occasions when you're carrying more than one lens, the Sony E/FE CaptureLENS from Peak Design will help you change lenses faster, and with added versatility. 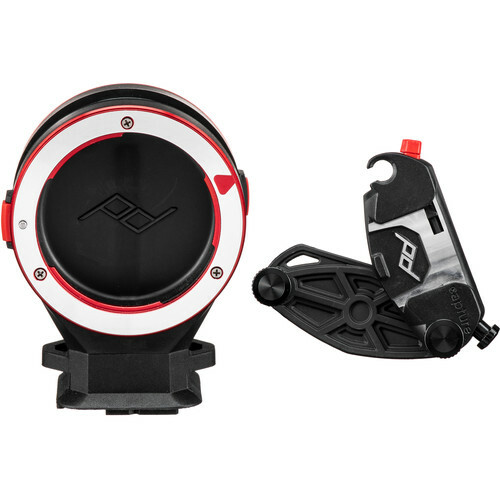 Simply attach the included clip and lens kit adapter to a backpack, strap, bag, or belt. With the CaptureLENS you can change lenses with one hand, while at the same time, have a convenient place to store the lens you just removed. An added benefit is that by storing the lens outside of your camera bag; space will be freed up for other gear. Box Dimensions (LxWxH) 7.2 x 4.6 x 3.3"
Sony E/FE CaptureLENS is rated 4.1 out of 5 by 18. Rated 4 out of 5 by Laurence from Good idea, works well This seems to hold two lenses (and it can), but works best when it holds one, and you can quickly change the one lens on your camera by putting the camera lens onto the CaptureLens, then removing the lens on the other side and putting it onto the camera. Putting this on an ordinary belt will likely twist the belt a bit from the weight,, but on an equipment belt it's fine. It does make changing quick and easy - much safer than struggling with only two hands. Probably best for shorter lenses than say, a 70-200 or such, though it can handle that. Rated 3 out of 5 by Vicente from Loose and clunky. Good idea but I got a loose and clunky unit. I'm afraid it might nick the lens mounting unit (or whatever it's called). Thinking of returning it but don't really like the hassle of the process. Rated 5 out of 5 by Eric L. from Feel Like Crocodile Dundee Now Other than ordering the Canon instead of Sony FE mount initially (watch out for preselected click button), the whole shebang is great. Shot a parade using Sony A7s II with a 70-200 hanging off my belt. Lens remained secure even while marching alongside bands shooting. Nary a concern about the lens swan diving to the pavement. I'll give their quick release camera clip a try when I get a second camera body. Rated 3 out of 5 by Sven from Large lenses need not apply. For small, light lenses it's a dream! Well designed addition to most kits although putting heavy and/or zoom lenses onto it results in a potential lens banging situation. Careful and well thought out placement of the bracket to a location that won't result in a heavy lens slapping around or potentially banging into something is important. It seems secure. Rated 5 out of 5 by alaskalars from Would not want to miss it It is great for small to medium lenses (use it for Voigtla^nder super wide Heliar 15mm with Hawk adapter, Loxia 21mm/f2,8, Batis 25mm/f2 up to the 90mm/f2.8 Macro). Bigger lenses I like to carry on the I own two so I can take 3 lenses and one on the Pek Design Slide camera strap. Rated 5 out of 5 by Tyler from Life saver! I bought this to be quicker with my lens switching and this thing is perfect! I tested this out for a festival aftermovie and it made my life so much easier. I carried 2 lenses at all times and was able to shoot and use my gimbal switching for each lens. Best purchase! Rated 3 out of 5 by Ed from Nice concept, but one major flaw This product is a creative solution to the lens juggling problem users may have when changing lenses. It can be attached to straps or belts of almost any width, or hang separately on its own strap (not included). In my opinion, the belt clamp, with its metal quick-release mechanism and one-size-fits-all width, seems overly heavy and bulky for use with narrow straps. This products one major flaw is the excessive play in the Sony E-mount bayonet: lenses rattle in it when attached! I was able to take up the slack by applying a few pieces of vinyl adhesive tape to the flat mating surface of the mount, but for the price this product should have been ready to use out of the box. Finally, I would suggest painting orientation dots on the plastic bayonet mount covers that come with this product. Rated 1 out of 5 by Sean from Doesn't fit very well. My Sony lens has a lot of play and is very loud when moving around. Can this mounted on the spidePro belt system? It cannot. The Lens Kit from Peak Design is designed to only be functional when utilizing our Capture Clip set up. This movement is a normal behavior for the product. Camera lens mounts have a spring that absorbs that jiggle which is why it doesn't jiggle on your camera. We opted to not include this spring to make the connection easier/less resistance.But know that your Lens is totally secure until you push that button in and release it from the kit. Its advertised as having a E/FE mount yet a review says Only E mounts. I have the 85MM f/1.4 GM &amp; the 24-70MM f/2.8 GM. Will these lenses work on this product?? Yes they will. I have the same lenses and they work fine since they are E-Mount just as the lenses you mentioned are. Does peak design capturelens has one for fujifilm? Do they have one for Sony Alpha lenses? Can you use an adapter on it safely? Does it have a divider (membrane) in the middle, so it can protect the back of the lens from dust, when only one lens is mounted? Yes,it has and I use it a lot of times for fast switching between lenses instead of taking it out in the bag during location shoot.Hope this helps.